One of Musical Notes Global’s favorite girl groups, LADAMA, is back with a brand new music video and it will brighten up your whole week. “Cumbia Brasileira” is enchanting and vibrant, paying tribute to the sounds of Colombia. The video was filmed in the Colombian city of Cali and features the participation of students of Escuela Canalon de Timbiquí. The song comes off LADAMA’s acclaimed self-titled debut album, which peaked at No. 1 on iTunes and Amazon’s Latin Albums charts and also produced the infectious single “Porro Maracatu,” which was remixed by Toy Selectah and included on EA’s FIFA 2018 video game soundtrack. 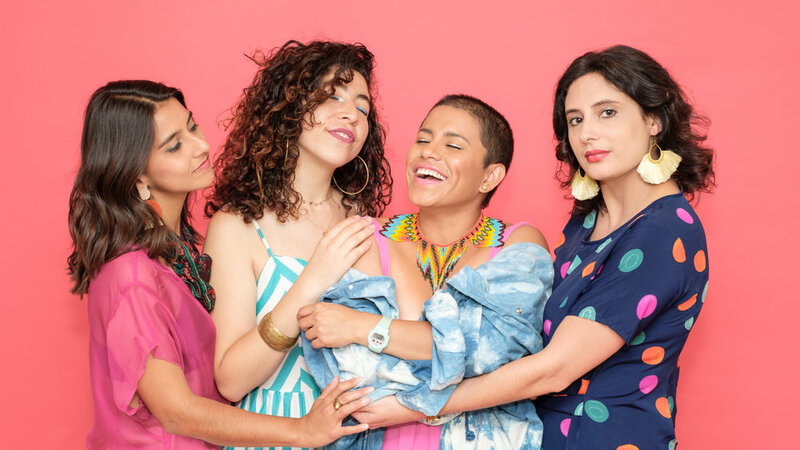 With origins across the Americas, LADAMA has garnered notoriety for their unique unified sound rooted in Afro-Latinx styles as well as for their efforts to empower youth and women on an international level. The band has participated in some of the world’s most prestigious thought leader events, including this year’s Skoll World Forum in the UK and a TED Talk at the TED conference in Vancouver, and was also invited to perform by the U.S. Embassy in Venezuela for a U.S. State Department-sponsored Venezuelan tour. LADAMA Continues Successful U.S. Tour + New Show Dates!